Play and production merge so felicitously in Susan D. Atkinson’s staging of “Tuesdays with Morrie” at Bristol Riverside Theatre, you find yourself totally engaged from the minute you see actor Richert Easley dance with brio in the various styles of Professor Morrie Schwartz to the inevitable, prepared-for moment when the ebullient Morrie is no more. Pacing, mood, lighting, and characterization combine to make Atkinson’s production a particular delight. “Tuesdays with Morrie” plays as if a perfect storm of theatrical elements centered on Bristol to create this warm, moving, entertaining piece that benefits greatly from being able to run straight through without an intermission so its charm can continue uninterrupted from its first bright moment to its last. Atkinson’s achievement is not to be taken for granted. “Tuesdays with Morrie” could go several ways as a play. Jeffrey Hatcher’s script from Mitch Albom’s best-selling book could turn from sentiment to sentimentality on a dime. Albom’s visits to a beloved Brandeis professor in the throes of succumbing to ALS (Lou Gehrig’s Disease) can easily become sappy or preachy or overbearing. Hatcher and Albom’s play could be middle-of-the-road, modestly interesting but only mildly affecting. “Tuesdays with Morrie” comes with lots of pitfalls, and Atkinson, with her cast of Easley and Danny Vaccaro, has adroitly avoided every one of them to provide a loving, human show that accentuates the wisdom and wittiness of Morrie Schwartz by allowing it to flow naturally rather than as a commodity. From Deborah Constantine’s lighting of a sometimes-flowering Japanese maple tree that dominates Andrew Deppen’s fittingly comfortable set to Jamie LaJoie’s perfectly timed and perfectly pitched sound design, Bristol’s “Tuesdays with Morrie” plays with the right kind of clockwork, steady and illuminating without a single jarring note or anything that is out of place or rankling. Atkinson’s mounting proceeds so beautifully and so absorbingly, it is difficult to find ways to praise it or to explain why things come together so well. They just do. Source material, script, and theatrical professionalism on various levels conspire to make this “Tuesdays with Morrie” a valentine to the theater and what it can accomplish in terms of storytelling, entertainment, and directing honestly affectionate attention to a special man in a special situation. Honesty is at the crux of Atkinson’s production. You feel as well as see the bond between Albom and Schwartz, even at times when Albom seems distracted or enmeshed in a non-stop lifestyle that eases some as his regard for Morrie progresses. You feel the peace and the desire for understanding that is at Morrie’s core. He likes to make people happy. He likes to give advice. He likes dispensing knowledge and wisdom, and even aphorisms. The great achievement in the Bristol production is you want to hear all Morrie has to say and enjoy reveling in his cleverness, joy, and embracing of life. Richert Easley makes that happen with the exuberance of his performance and the range he gives to Morrie, who is a negotiator and dealmaker as much as he is a teacher and a friend. The dimension and spirit with which Easley endows Morrie makes the audience love him as much as Albom does. We don’t have to worry about sappiness or accepting everything Morries thinks or says because Easley keeps Morrie’s tone conversational, a part of the dialogue, rather than a pronouncement of some profound truth. He creates a vibrant, avuncular man with a big personality whose ideas shed light on life and how to live it happily. Morrie’s joy and enthusiasm are contagious, all because Easley portrays them so authentically and makes them assets instead of a reason to run to the pharmacist for insulin. Morrie’s spirit is also poignant because in the back of our minds, no matter how animatedly Easley portrays him, we know Morrie is dying from an unescapable disease. Striking the right note at the right time is the key to Atkinson’s success with “Tuesdays with Morrie.” She keeps the piece from being trite or from becoming a moral tale by concentrating on the people, Morrie and Mitch, instead of events or incidents. Nature is the cue. Easley presents Morrie as a total human being, a male hoyden whose carefree boisterousness and innate love of talk and communication make him wonderful company. Danny Vaccaro, in turn, transforms Mitch from a driven man, one who visits Morrie at first because of a combination of curiosity and obligation, to one who more sensitively organizes life priorities. Mitch is of a different stripe from Morrie. Although he intended to be a jazz pianist, he found success as a sports reporter with a featured column in a major Detroit newspaper, a place on radio and TV, and entrée to every significant sports event in the world. Far from Morrie’s contemplative, philosophical life, Mitch’s is full of stress, pettiness, and angst. He has to juggle schedules to accommodate all of his commitments. He has to be ready to pounce on a story or interview opportunity. He needs to be wary of competition and deal with the reaction of athletes who may not like everything he writes or reports. Mitch’s world is non-stop, without even the built-in breaks of vacations or days off. On the Tuesdays he sees Morrie, he flies from Detroit to Boston, drives to Newton, Mass., then reverses the itinerary two short hours later to be back in Detroit for in time his 11 p.m. newscast. He is as tethered to the insistent, incessant ringing of his cell phone as Morrie is attuned to the gentle, gradual seasonal changes of his Japanese maple. Vaccaro is unafraid to let the constant frazzle put Mitch in a temperamental or unattractive light. Like the production as a whole, the actor walks a fine line between what is needed and what would be excessive, so he shows you the pressure Mitch is under and the attitude he has to adopt to deal with it while keeping the audience on Mitch’s side and more sympathetic with him than irritated by him. Balance is critical in theater, and Bristol’s “Tuesdays with Morrie” finds even keel immediately and stays there. The show has emotional ups and downs and dramatic highs and lows, but they are kept in context and in proportion, so the balance of the production is never upset. “Tuesdays with Morrie” tells the story of a rekindled relationship between a college professor and a former student. Morrie Schwartz teaches sociology at Brandeis, where he is a bit of a legend. Mitch Albom, freshman, registers for one of Morrie’s classes, hears one question, and is about to walk out thinking he’s made a mistake, when Morrie charms him into staying. Morrie is so engaging a professor, Mitch eventually takes all of his courses and is graduated from Brandeis with a degree in sociology. His professional interest lies in music. He wants to be a jazz pianist and spend time at Brandeis practicing in music rooms, sometimes with Morrie listening surreptitiously outside the door. Life throws Mitch a curve, the death by pancreatic cancer of a favorite uncle, a musician, age 42, and he loses interest in the piano and the nightclubs of Manhattan. Instead he obtains an graduate degree from Columbia and seeks work as a sportswriter, which he finds and from which he thrives. Although he haunted Morrie’s office and house while a student, and promised Morrie that he would stay in touch him, Mitch’s ambitious pursuits and heavy responsibilities remove his professor from his thoughts, and he doesn’t resume contact for 16 years. The catalyst is a “Nightline” piece Ted Koppel does about Morrie, a well-known Brandeis professor who has been diagnosed with ALS. Morrie talks to Koppel about the prospect of dying and other life matters. Mitch sees the story and decides he needs to call his old teacher to see him at least once more before ALS claims him. Just as Morrie enticed Mitch to remain in his sociology class that first day, he inveigles him to visit more often. The visits are eventually scheduled for every Tuesday, a day that coincides with the one when Morrie had office hours and met with students like Mitch in his office. A panoply of topics is covered in each meeting between Mitch and Morrie. A good student, a good reporter, a shrewd writer with an eye towards a market, and a sincerely good friend, Mitch prepares questions about life and death for Morrie to answer. Morrie loves to expound, so the questions are like nickels in a jukebox to him. Feed him a coin, and off he goes talking about the subject at hand. As I’ve said, this can be dangerous ground for theater. In the wrong hands, someone talking philosophically and being serious about it can explode into preachy trivia or, worse, boredom. Not in Bristol. You like Mitch and Morrie so much, you can’t wait to hear the questions and much more want to hear Easley give Morrie’s answers, which he does by talking to Mitch instead of lecturing him on waxing on just to hear his own voice. ALS informs every scene. When Morrie is relatively asymptomatic, it hovers in the background to remind the audience that debilitation will at some point set in. As Morrie show more signs of ALS, the thought of his death becomes abhorrent yet something that must be faced. Easley is particularly deft at playing the varying stages of Morrie’s decline, at first being subtle with a small halt in his step or pause in his speech. The actor shows great range at Morrie’s condition worsens. You want to run to him, as Mitch is often there to do, when he is struggling for breath or hoping for someone to come and help him change to a new position in his wheelchair. Even as he displays Morrie’s suffering, Easley retains Morrie’s humor and zest or life. His voice continues to have a lilt, his eye a twinkle. You ache more for Morrie because Easley lets you sense the indomitability that must eventually succumb to an illness that shuts down each organ of the body in turn. Meanwhile, Vaccaro, as Mitch, softens. He puts his time with Morrie ahead of anything that might happen in his career as a broadcaster and journalist. He relinquishes big stories to second stringers or others on his newspaper’s staff. He forgoes attending the World Series. His life takes on more perspective, and he can allow himself to think about more than basketball scores or what athlete missed which practice, etc. “Tuesdays with Morrie” in Bristol if all of a piece. It plays as smooth as butter and elicits sincere emotion with its honest, affectionate touch. Susan Atkinson’s production reminds one what theater is at its finest, a simple, intelligent relation of a good story with characters that are worth hearing and watching. Atkinson and her cast found the truest, most natural, and most moving path to “Tuesdays with Morrie.” Not one wrong or disturbing note is sounded in the entire production. The show maintains a sweet intensity deepened by the awareness that one of the main subjects being dealt with is a man’s death. From the performances of Easley and Vaccaro to the contributions of the designers, “Tuesdays with Morrie” is finely detailed and presented. The production is lovely, just lovely. 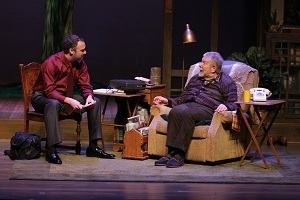 “Tuesdays with Morrie” runs through Sunday, February 16 at the Bristol Riverside Theatre, 120 Radcliffe Street, in Bristol, Pa. Showtimes are 7:30 p.m. Wednesday and Thursday, 8 p.m. Friday and Saturday, 2 p.m. Wednesday and Saturday, and 3 p.m. Sunday. 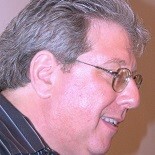 Tickets range from $51 to $40 and can be obtained by calling 215-785-0100 or going online to www.brtstage.org. This entry was posted on February 3, 2014 by nzoren in Theater Reviews and tagged Brandeis, Bristol Riverside Theatre, Comedy, Danny Vaccaro, drama, Mitch Albom, Morrie Schwartz, Nightline, Richert Easley, Susan D. Atkinson, Tuesdays with Morrie.